The work is based around the idea of a kind of psychic terraforming. It is conceived of a proposal that the ground on which events take place have somehow assimilated echoes, traces and impacts of the historical events that occur on them; that they are disturbed or unsettled by circumstance. The former RAF Greenham Common is a site with a contentious history; occupied by the USAF during the Cold War and host to an arsenal of nuclear warheads in the form of ground launched cruise missiles it was also the site of a Women’s Peace Camp who occupied the perimeter of the site for nearly nineteen years in protest at the housing of such weapons. After the closure of the base, the common ground around the airstrip was gifted back to the public domain, while other facilities on site were sold (or continue to be offered for sale). The landscape has taken on a curious transformation with unusually flat features, scars of incongruous flint stone chips, raised welts of earth and the occasional ventilation shaft; more an earthwork than a landscape. All this while cattle graze against the backdrop of an industrial business estate and the artificial mesa of the unsold GAMA silos. The work can’t help but be grounded in the specifics of site but nevertheless attempts to lift off from the terrain to conceive of this kind of transformation in landscape with other sites. In particular the planet Mars as a site of imminent transformation. Mars is a landscape in waiting; it is not just its dead, red soil that will become transformed but its place in the pantheon, its potential aura as both a harbinger of agricultural viriditas and war. It is not without it’s own inbuilt conflict as ethical debate polarises itself across ‘red’ and ‘green’ arguments; for respectively biocentric and anthropocentric positions on what is to be made of Mars. It should remain as it is, untouched, it’s dead life is it’s own unique biology; it should be transformed into a habitat suitable for human life. Kim Stanley Robinson’s Mars trilogy is a touchstone text in this dialogue, articulating the political anxieties and intents over such a project. 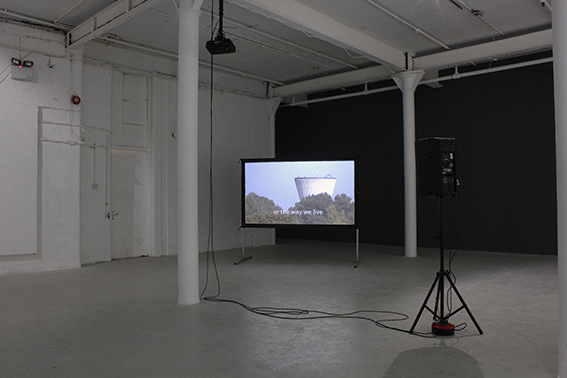 The screen supports an unstable ground, in which visualisation becomes problematic and video a means of discourse rather than image. The work aims to pass through the screen/video matter, to uncover in its interpolated forms the traces of this instability.